This species is accepted, and its native range is Tropical Africa, Comoros, Madagascar. Medium-sized liana, lianescent shrub, shrub or small tree up to ± 10 m. tall and 30 cm. trunk diameter. Branches and branchlets hollow or not, lenticellate or not, the branches glabrous or glabrescent, the branchlets from glabrous to tomentellous to tomentose, the indumentum silvery to ferruginous, usually glabrescent. Stipules early caducous or not, simple, usually entire, sometimes denticulate, triangular, usually narrowly so, (1–)2–5(–7) mm. long, hairy as branchlet or more densely so. Petiole 2–11(–15) mm. long, usually hairy as branchlet; blade obovate-elliptic, broadly to narrowly so to lanceolate, sometimes ovate or almost circular, (3–)5–17(–32) × 2–10(–15) cm., cuneate to cordate at base, usually gradually short-acuminate, sometimes abruptly so or rounded to obtuse or even emarginate at apex, the acumen obtuse to mucronate, up to 2 cm. long; nearly glabrous to densely tomentellous to pubescent or tomentose both surfaces when young, usually soon glabrescent, but often hairs longer persistent on the usually impressed midrib above, sometimes with hairy domatia in the axils of the 5–10 pairs of main lateral nerves beneath; glands usually small. Inflorescences very variable from sessile to distinctly pedunculate, few-many-flowered, tomentellous, tomentose or pubescent; peduncle 0–1.5(–2.5) cm. long; bracts and bracteoles minute, ovate-triangular, up to ± 0.5 mm. long; pedicel 0–4(–6) mm. long, the upper part 0–0.5(–1) mm. long, tomentose. Sepals erect or nearly so, ovate-triangular to oblong-elliptic, (1–)1.5–2.5(–3) × 0.5–1(–1.5) mm., tomentose outside, more sparsely so and mainly on upper part inside. Petals suberect, oblanceolate in outline, (1.7–)2.5–4(–5.5) mm. long, split (0.2–)1–2(–3) mm., glabrous or with a few hairs below split outside. Stamens erect, (1.5–)2.5–6(–7) mm. long, glabrous, rarely with a few hairs on filaments. Pistil 2–3(–4)-merous, (1–)2.5–6(–9) mm. long; ovary and lower part of style villous to sericeous-velutinous, upper part of style glabrous. Fruit globose to ellipsoid, apiculate or not, 1–2(–3)-seeded, puberulous-tomentellous to almost glabrous, sometimes prominently veined; 1-seeded fruits 1–6 cm. long, 1–2.5 cm. in diameter. Seed subellipsoid, ± 10–30 mm. long, 5–10 mm. in diameter. Shrub; young branchlets puberulous or glabrescent; lenticels sparse or numerous on the young and old branches. Leaf-lamina 5–11 × 2–4 cm. oblong or subelliptic, acute or shortly caudate at the apex, cuneate at the base; lateral nerves 5–6 pairs, conspicuous above, prominent below; petioles 2–10 mm. long; stipules c. 2 mm. long, linear, caducous. Cymes c. 7-flowered, axillary, subglobose, sessile; pedicels 1–1·5 mm. long, pubescent. Sepals c. 2 mm. long, pubescent outside. Petals c. 4 × 1·4 mm. glabrous, narrowed below, 2-fid. Ovary woolly-tomentose; style c. 4 mm. long, glabrous, shortly 3-lobed. Dichapetalum subcordatum (Hook.f. ex Benth.) Engl. Chailletia paniculata (Thonn. ex DC.) Benth. Chailletia subcordata Hook.f. ex Benth. 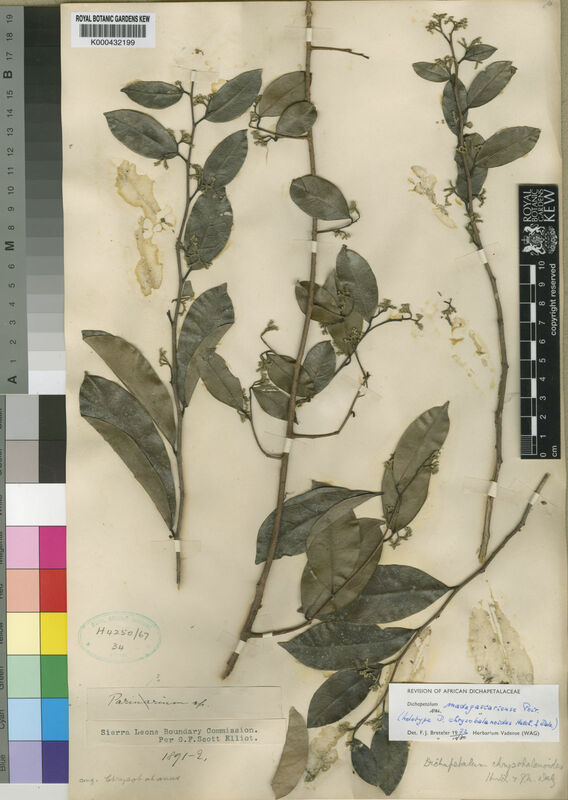 Dichapetalum paniculatum (Thonn. ex DC.) De Wild. Rhamnus paniculata Thonn. ex DC. Breteler in Med. Landbouwh. 81-10: 13, fig. 2–4 (1981). Poiret in Lam., Encycl. Méth. Bot, Suppl. 2: 470 (1812).